The current knowledge does not prepare a precise scientific tool for quantifying the effects of inputs particularly ecofriendly inputs such as superabsorbent polymer (SAP) and humic acid (HA) are being used to increase soil fertility, improve crop performance and finally food production. This study was designed and conducted aimed to suggest an innovative approach not only to identify and quantify the effects of these inputs but also to determine the efficient path among underground/aboveground relationships associated with sesame oil production. Two experiments were conducted at the Research Farm of Ferdowsi University of Mashhad using randomized complete block design with split strip plot arrangement and three replications in two successive cropping years (2015–2016) to evaluate the effects of SAP and HA on Sesamum indicum L. growth characteristics and oil production under two different irrigation levels including: supplying 50 and 100% of the sesame water requirement were allocated to the main plots. Applying of SAP (80 kg ha−1) into the soil and control (no applying SAP) were allocated to the subplots. Foliar application of HA (6 kg ha−1) and control (not applying HA) were allocated to the strip plots. The analysis of variance revealed that the effects of HA and SAP on many sesame traits also soil properties were significant. 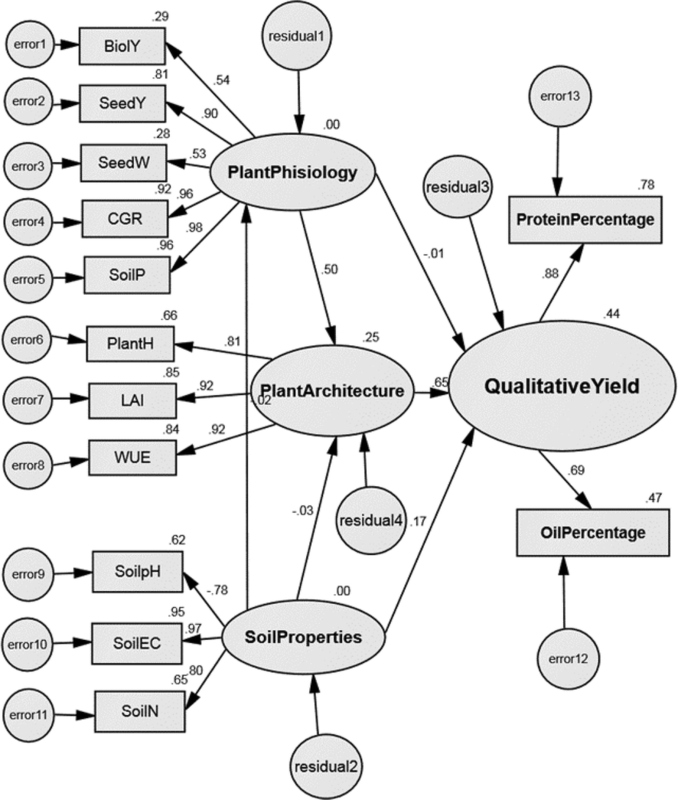 The fitted structural equation model suggests a direct strong-positive effect of leaf area index (LAI), plant height (PlantH) and water-use efficiency (WUE) on plant architecture construct (PlantArchitecture), soil nitrogen content (SoilN), soil electrical conductivity (SoilEC), and on soil properties construct (SoilProperties), which finally increase the sesame qualitative yield production. The calculation of the standard regression coefficients of the model’s variables revealed that variables including: LAI, WUE and PlantPhysiology have had the most causal effect to defining the yield of sesame oil under the field condition of SAP and HA application. The findings in our study suggest that the direct advantages of SAP and HA application is to increase PlantPhysiology, PlantArchitecture and SoilProperties by 65, 50 and 17 percent, respectively, through contributing to the respective processes. Generally, the coefficient of determination of the suggested model (R2= 0.44) indicates that the model explains 44% of the variations in the sesame qualitative yield. The present study suggests employing the structural equation modeling could be best taken as a precise and practical quantitative modeling approach rather than a specific statistical technique, not only to quantify the effects of inputs and management operations but also helps to profound our understanding to identify the most efficient paths involved to certain process which in turn prepare options to reduce production costs beside to produce healthy food and products. Promoting agriculture based on the practices and management strategies that increase the efficiency of agricultural inputs is a main challenge, particularly in developing countries. Agroecological management leads to optimal recycling of nutrients and organic matter turnover, closed energy flows, water and soil conservation, balance in the population of pest–natural enemies, and all the key processes in maintaining the agroecosystem’s productivity and its self-sustaining capacity . Recognizing and quantifying of involved crop ecophysiological processes and mechanisms, management and environmental factors affect inputs uptake, utilization and efficiencies are necessary to increase input productivity. Structural equation modeling (SEM) is one of the most recent innovations for this purpose. The statistical tools used by agroecologists should be able to provide useful ground and offer insights into the systems of inter-correlated entities and events in the studies of all the ecological systems such as “Crop-Soil resources” system. A fundamental premise of SEM is that abstracting systems works as probabilistic networks that provide scientists with a practical and effective way to study cause and effect relationships . To achieve this goal depends on complex responses to the prescribed management activities (in other words, understanding the cause-and-effect pathways of these responses), and on our ability to utilize this understanding to design efficient systems or paths for meeting defined objectives . When causality is relatively well known in an ecosystem, SEM has the great ability to partition direct and indirect effects, making distinct multiple pathways by which one entity can influence another . Accordingly, the strength of these various pathways can then be estimated and compared , that is why since the year 2000, SEM has been getting increasingly popular in ecology. Prelude to that, the first generation statistical methods (e.g., ANCOVA, multiple regression) did not act satisfactorily when the goal was to study the biological mechanisms that leads to an outcome . “crop–soil resources” system dynamics are driven by complex arrays of simultaneous cause and effect relationships. Understanding this complexity requires high sophisticated analytical tools and methods such as SEM which has been lost yet. The uncertainty of rainfall, increased temperature in arid and semi-arid regions is prominent all over the world, which encourages the efficient water-conservative irrigation technology of super absorbent polymers (SAP) . Water SAP may contain over 99% water. SAP have been defined as polymeric materials that have the ability to swell in water and retain a significant fraction (> 20%) of water within their structure, without dissolving in the water content. The applications of SAP have grown extensively . These materials have 100% natural structures and are not dangerous to the environment. The success of using SAP to reduce crisis such as soil erosion, frequent droughts or providing food security, requires the knowledge of their behaviors and performances in the soil . Robiul Islam et al. reported that 15 kg ha−1 of SAP plus 150 kg ha−1 of nitrogen was the optimum rate for sustainable corn production, which maintains proper nutrient balance in the soil, increased plant height, stem diameter, leaf area, biomass accumulation and relative water content, as well as the protein and sugar contents in the grain. It is widely accepted that SAP could be an advantage for plants against drought stress  mainly through improved water-use efficiency . Humic acid (HA) is one of the most important components of the bio-liquid complex. It provides numerous benefits to crop production. It helps to breakup clay-compacted soils, improve soil physical properties, assists in transferring micronutrients from the soil to the plant, enhances water retention, increases seed germination rate, improves water, air and root penetration, and stimulates the development of microflora population in soils [20, 23]. The application of 1000 mg L−1 of HA reduced the mean germination time of sesame seeds. In addition, the highest germination index, the longest seedling was obtained by HA treatment. HA increased the total soluble protein content by 32% compared with the control . Wafaa et al. reported that some chemical soil properties including soil pH, electrical conductivity (EC), organic matter and the available N, P and K increased in soil along with the application of phosphorus sources combined with a high rate of HA. They also mentioned that the high rate of HA had enhanced the phosphorus-use efficiency of sesame. Atia et al. reported that foliar spray with HA led to significant increase in protein, oil, carbohydrate contents, P%, K% and the concentrations of micronutrients (Fe, Zn, Mn and Cu) in sesame. Significant increases were obtained in proteins %, P%, K% and oil %, protein yield, P and K content, and oil yield for sesame seeds due to gypsum application, foliar spray of humic acid and/or amino acids . Jahan et al. reported the highest and the lowest seed yields of bean (Phaseolus vulgaris L.) were obtained in the application of 80 kg ha−1 SAP + HA and non-application of SAP and HA, respectively. Despite the increased interest in utilizing SAP and HA in crop production systems, particularly sustainable low input systems; there is little comprehensive information on the simultaneous application of these alternative inputs on crop responses under the field’s conditions. However, sesame, though an important oil seed crop, is yet known across the world as a neglected or underutilized crop . Conducting researches on sesame cropping specially in low input systems could provide the necessary background to regain the actual position of sesame production. A study of sesame response to SAP and HA is inevitable for the successful reintroduction of sesame into the ecological systems in arid and semi-arid regions. This research and the consequent proposed method was designed with a new perspective and insight to identify and quantify the cause and effects relationships of SAP and HA application under an ecological sesame cropping system as a novel SEM approach. This approach was mainly due to the previous lack of a reliable method for this purpose. These new identified relationships present great possibilities to improve agronomical management and operations. Field studies were conducted in 2015 and 2016 at the Research Farm of Agriculture Faculty, Ferdowsi University of Mashhad, Iran (latitude: 36°15′N; longitude: 59°28′E; elevation: 985 m above sea level). The experiment station was located in Kashaf Rood watershed at the northeast of the country, in a semi-arid region with a mean annual precipitation of 252 mm and temperature of 15 °C. 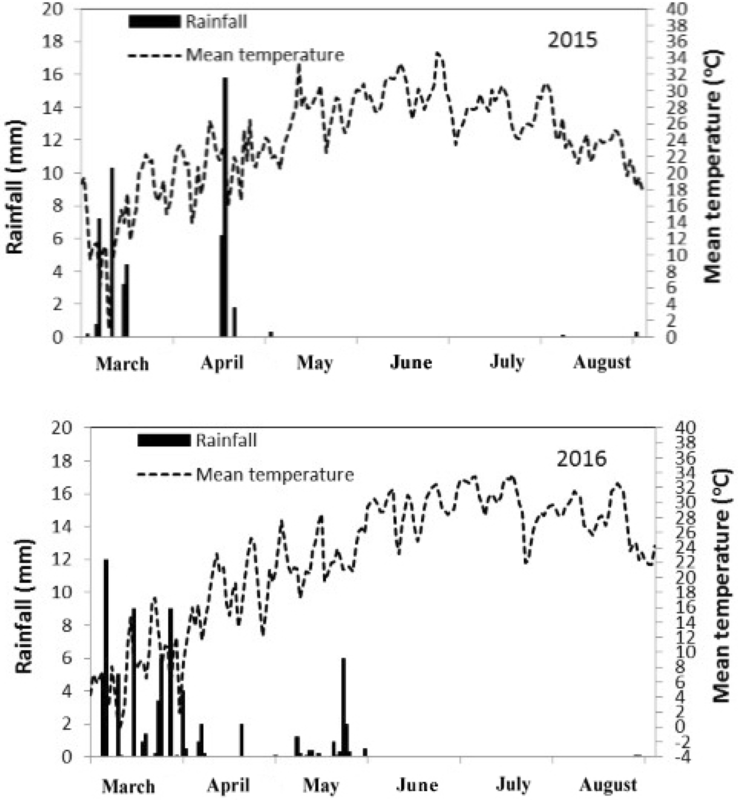 Average temperature and precipitation rate of the Research Farm for 2 years are shown in Fig. 1. Soil samples were taken from 0 to 15 and 15 to 30 cm depths and analyzed for some physiochemical properties before conducting the experiment (Table 1). The soil was loamy silt (Typic Haplocalcids) . The experiments were conducted at the Research Farm of Ferdowsi University of Mashhad using Randomized Complete Block Design with split strip plot arrangement and three replications in two successive cropping years (2015–2016) to evaluate the effects of SAP and HA on sesame growth characteristics and oil production under two different irrigation levels including: (1) supplying 50% of the sesame water requirement, (2) supplying 100% of the sesame water requirement that were allocated to the main plots. Applying of SAP (80 kg ha−1) into the soil and control (no applying SAP) were allocated to the sub plots. Foliar application of HA (6 kg ha−1) and control (no applying HA) were allocated to the strip plots. The characteristics of applied SAP (AQUASORB®: SNF Co. Ltd, UK) and HA (POWHUMUS® WSG 85: Humintech GmbH) is represented in Tables 2 and 3, respectively. Main plots of 6 × 3 m, separated with a distance of 1 m to avoid nutrient mix-up during irrigation, and consisting of seven rows were arranged to sow the sesame seeds. Each main plot was divided into two equal parts and SAP fine granules were properly mixed with the soil using a spade immediately before sowing. Using CropWat® software , the sesame water requirement was estimated as 200 m3 to supply 100% of the water requirement in each period of irrigation, giving consideration to local experiments and conditions, daily evapotranspiration data and the length of sesame growing period. The sowing dates (May 5, 2015–16) were the same for the 2 years of the experiment. An eco-climate-appropriate sesame seed was sown. Sesame seeds were planted on rows 50 cm apart and with 10 cm distance between the plants on the rows. The experiment sites were different for the 2 years of the experiment, but adjacent, and underwent fallow during the last year. The plots were immediately irrigated after sowing and after every 7-day interval. The plant density was 30 plants m−2. Each plot was divided into two sections, one for seed yield and to determine its components and the other one for destructive sampling during the crop growth period. The leaf area and dry matter yield [biological yield: (BiolY)] were measured every 2 weeks. The leaf area was measured with the leaf area meter, Li-Cor, LI-1300, USA. The leaf area index (LAI) was calculated by dividing each leaf area value into unit ground surface areas. Seed yield (SeedY) was measured form reserved 1 m2 of each plot, while considering the marginal effect. The oven-dried plants (at 80 °C for 48 h) were weighed. The BiolY, SeedY and seed weight per plant (SeedW) were measured. At the end of the growing season, the plant’s height (PlantH) was measured. where Ys is seed yield (kg ha−1), WI is irrigation water volume (m3 ha−1), and WP is rainfall amount (m3 ha−1). CGR = g (dry matter) m−2 day−1. where GA is ground area per plant (m2), W2 is plant dry matter weight in the second sampling (g m2), W1 is plant dry matter weight in the first sampling (g m2), T2 is the second sampling time (day), and T1 is the first sampling time (day). At the end of the growing season, soil samples were taken from 0 to 15 and 15 to 30 cm soil depth and the total amount of nitrogen (SoilN) (Kjeldahl’s method), available phosphorus (SoilP) (Olsen’s method), soil pH (SoilpH) and soil electrical conductivity (SoilEC) were determined according to FAO guideline  (Table 1). The seed oil content (OilPercentage) was determined by treating the weighed milled seeds with n-hexane after been refluxed for 12 h in a Soxhlet extractor apparatus. The solvent was removed by a rotary evaporator. The extracted oil sample was then placed in a vacuum oven kept at 60 °C for 30 min, it was then accurately weighed and its oil percentage was determined based on the initial seeds weight. The protein content of the defatted seeds (ProteinPercentage) was determined using the AOAC Official Method 968.06 (4.2.04) . The seed nitrogen content was determined based on the Kjeldahl method and using a Kjeldahl analyzer (Kjeltec system Model 8100, FOSS Ltd., Denmark) per treatment for three samples. The ProteinPercentage was calculated by multiplying the nitrogen percentage by 6.25. To determine the effect of HA and SAP application on the studied traits, data were subjected to analysis of variance using Minitab® Statistical Software Ver. 17. The ANOVA revealed that the effects of HA and SAP on many sesame traits also soil properties were significant (data not shown). Then, to conduct SEM data matric used for ANOVA was imported to IBM® SPSS® AMOS Ver. 21 software in the format of spreadsheet using MS Excel® Ver. 14 software. 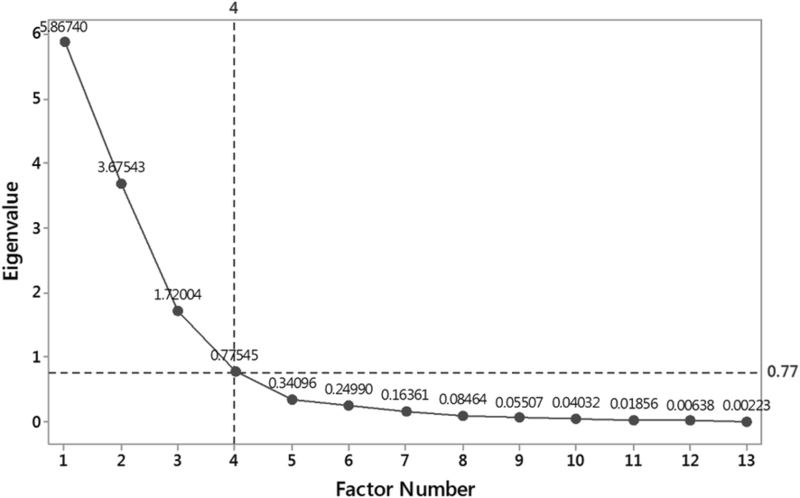 At the first step, a confirmatory factor analysis was performed using Minitab® Statistical Software Ver. 17, which resulted in four distinguished factors. Then, the variables with the highest load (weight) on each factor were determined. SEM (also known as LISREL1) was then performed using IBM® SPSS® AMOS Ver. 21 to determine the factor with the most significant influence on sesame qualitative yield, including oil and protein production with consideration for the ecophysiological basis of sesame growth and development. The IBM® SPSS® AMOS can quickly create models to test hypotheses and confirm relationships among measured and latent variables to gain additional insight. It goes beyond regression. Developing an initial path model (causal relationships between variables) based on the theory. Testing the obtained path model against data (paths imply a structure to the covariance matrix). Testing the implied covariance structure against actual structure (agreement between implied and actual structures validates the causal relationships revealed by the paths). Revising the path model as many times as possible to find the best validating relationships (the model goodness of fit was evaluated each time by the root mean square error of approximation (RMSE) and goodness of fit index (GFI). Calculating and reporting the coefficients describing the strength and direction of paths (path coefficients; multiple correlation coefficients; regression coefficients). Following the analysis, four factors were determined considering the eigenvalue of each factor on the scree plot (Fig. 2). Considering the variable loads and ecophysiological basis among them, the four determined factors were nominated as plant physiology (PlantPhysiology), plant architecture (PlantArchitecture), soil properties (SoilProperties) and qualitative yield (QualitativeYield) latent constructs, respectively (Table 4). The cumulative variance of the fourth factor was reached up to 92% (data not shown), which is adequate for further analysis. Correlation coefficients, squared multiple correlation coefficients, covariance matrices, direct and indirect path coefficients were also calculated. Finally, RMSE and other validity tests were applied to evaluate the efficacy of the model. Cronbach’s Alpha Reliability Test is one of the several indices used in measuring the internal compatibility of questions on a questionnaire. It is also applicable to tests and observable variables within an index or latent construct. When a construct or an index has internal compatibility, it means all questions or construct constitutional variables are highly correlated. Some researchers suggested Cronbach’s Alpha should be 70% or higher to ensure construct validity [6, 7]. A normality test was performed. Transformation was also performed for numerical data where needed. To ensure the uniformity of treatment variances, the Bartlett’s test was used. Since there was no statistical difference between the experiment data of 2 years, the mean values of each trait during 2 years were reported. Data analysis and graph plotting were done, using the Minitab® Statistical Software Ver. 17.1, IBM® SPSS® AMOS Ver. 21 and Microsoft Excel Ver. 14. By confirmatory factor analysis, the variables were divided into four groups. Then, the variables with the highest load on each of the groups were dedicated to the related factor according to Table 4. The first factor including three variables, the second factor including five variables, the third factor including three variables and the fourth factor including two variables. Although assigning of the variables to the factors was conducted based on the “factor loadings”, acquired from analysis output by Minitab® Statistical Software Ver. 17.1, there are also remarkable empirical eco-physiological evidences supporting factor loading in our variable assignment. In cluster analysis, the variables were grouped into four clusters, confirming the above reasoning (Fig. 3). SEM was then used to determine which factor had the most significant influence on sesame performance and quality. Considering the role of each crop trait in yield formation (crop growth and development), more analysis was performed to call PlantPhysiology, PlantArchitecture, SoilProperties and QualitativeYield as latent constructs based on factor dedication methodology (Table 4). To check the reliability of the analysis, we had to show the required precision of measurement of the variables in each factor, thus, Cronbach’s Alpha Reliability Test was applied. In our study, the QualitativeYield construct was rated as 0.768, indicating high-substantial reliability. The Cronbach’s Alpha for the PlantPhysiology, PlantArchitectural and SoilProperties constructs were rated as 0.735, 0.712 and 0.694, respectively. Although theoretical or latent constructs are not directly measurable, in the classic analysis of experimental designs, certain variables such as crop biomass and yield are measured, thereby comprising the main crop traits that represent plant performance. The research model we proposed has been thoroughly shown in Fig. 4. This model consists of four measuring models including: (1) the PlantPhysiology measuring model, (2) the PlantArchitecture measuring model, (3) the SoilProperties measuring model and 4- the QualitativeYield measuring model. These measuring models were related through the structural model . In other words, after assigning all measured variables to the four factors (four latent constructs), the next step was defining how these factors do interrelate by path analysis based on SEM. Causality path from one latent construct to another one is shown by an arrow. Figure 4 shows the standardized values of path coefficients and the coefficient of multiple correlations for each variable and construct. To enhance comprehension, Table 3 shows the regression coefficients of the model constructs as an independent variable, and the measured variables as a dependent variable, as well as the related standard error, critical ratio of t statistic and their probabilities. Table 4 shows the standardized regression coefficients of the model constructs as an independent variable to determine the most effective coefficient more easily. The effect of QualitativeYield construct on OilPercentage is 0.688, which indicates one unit increase in standard deviation of the QualitativeYield results in 0.688 unit of increase in standard deviation of OilPercentage. This coefficient for ProteinPercentage was 0.882. The regression coefficients of the measured variables including SoilP, WUE, SeedY, PlantH, SoilEC and SoilpH were significant at 0.01 level of probability. The remarkable results are the significant regression coefficient between the PlantPhysiology and PlantArchitecture (0.672, p ≤ 0.02), and between the PlantArchitecture and QualitativeYield (0.410, p ≤ 0.01). The variance and covariance of all the measured variables has been shown in Table 5. The diagonal and non-diagonal elements of the matrix are variances and covariances, respectively [16, 27]. Covariance indicates the intensity and direction of two variables related to each other, which are called correlation. Model parameter estimations were based on calculations between variances and covariances. Some considerable amounts in covariances included: OilPercentage-PlantArchitecture (0.860); OilPercentage-BiolY (130.04); OilPercentage-SeedY (75.39); BiolY-CGR (492.13); SeedY-CGR (285.32); BiolY-WUE (34.96). Lamb et al. proposed that the analysis of variance/covariance matrices provides comprehensive interpretation of the changes in the path coefficients across the scales, and can be implemented using any standard SEM software package. Correlation coefficients between the measured variables indicating the standardized values of the covariances (Table 5) have been shown in Table 6. In other words, Table 6 indicates the rate of relations between the measured variables. Seed oil content (OilPercentage) was highly correlated with seed protein content (ProteinPercentage) (0.60), LAI (0.40), and WUE (0.40). A strong-positive correlation (r = 0.52) was observed between QualitativeYield and PlantH. Table 6 shows the correlation coefficients of LAI-PlantH (0.74), LAI-WUE (0.84), PlantH-WUE (0.74), CGR-SoilP (0.94), CGR-SeedY (0.86), SoilP-SeedY (0.88) and SoilN-SoilEC (0.78), which means that the effects of HA and SAP are indirect and were mainly realized by increasing SoilEC, SoilP, CGR, WUE and SoilN. Some researchers previously proved that the SAP and HA increase the plant leaf area . The values of the squared multiple correlation have been shown in Table 7 in relation to the variable groups. These values are in fact the coefficient of the dependent variables (PlantArchitecture and QualitativeYield constructs) and the coefficients of the measured variables in all following rows; the value of the fourth row is equal to R2 of regression analysis , i.e., the value of 0.442 of QualitativeYield as the dependent variable indicates that the suggested model explains 42.2% of variations of the QualitativeYield variable. The squared multiple correlation in fact indicates the concept of reliability . In other words, the QualitativeYield value is the same as the squared standardized factor loading. For example, the value of 0.949 (= squared of 0.974 in Table 6) for SoilEC means: SoilProperties explain 94.9% of SoilEC variations. From another aspect, the values of squared multiple correlations indicate the adequacy of every variable (Table 8). When the correlation coefficient is between 30 and 50%, it means that the measured variable is relatively week, but could be enough to continue analysis. The values more than 50% mean that the measured variable is eligible to calculate the latent variable [6, 24]. As shown in Table 9, the major values are more than 0.50, indicating they are ideal indices to assay their own latent construct. Conclusively, variables empowering QualitativeYield as the final determining factor enables higher seed oil yield. In the present study, the application of SAP plus HA foliar application made the dominant ability of PlantPhysiology beside PlantArchitecture more effective resulting in a higher seed oil yield. Remarkably, since variables such as LAI, PlantH mainly defines plant radiation capture ability ; HA application also indirectly increases radiation capture through the sesame shoots. Root system development and nutrient capture are physiologically followed by the shoot ability to capture and use radiation . 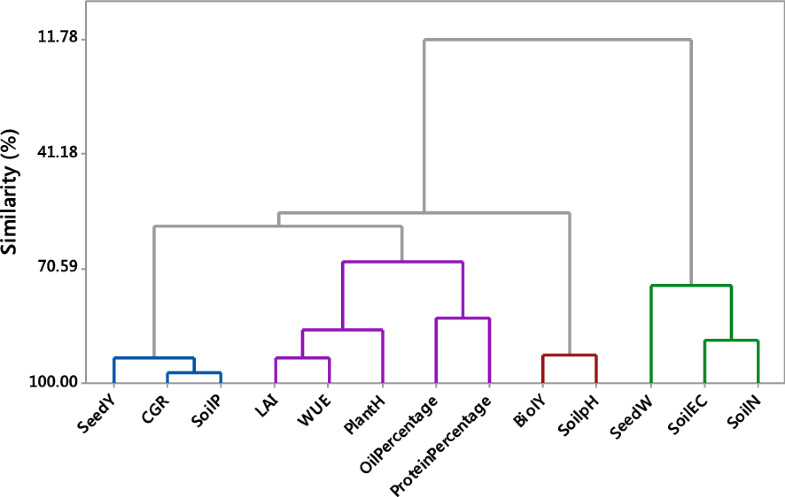 Generally, Table 9 indicates the high-squared multiple correlations of CGR, SoilP and SeedY, with PlantPhysiology construct, WUE, LAI, PlantH with PlantArchitecture, SoilEC, and SoilN with SoilProperties construct. Conversely, the lower-squared multiple correlations of SeedW and BiolY suggests that the final determining factor of sesame oil yield is in fact its ability to take up and utilize resources including radiation, water and nitrogen. As formerly explained, the higher-squared multiple correlations of LAI and PlantH as radiation capture ability had the most impact in determining sesame yield (LAI, PlantH potentially define optimum space distribution of the leaf area2) . Subtracting sample covariance matrix (which was obtained directly from sample data were measured in this study using Minitab® software) from the implied covariance matrix (also called actual covariance matrix; which was predicted for population based on multivariate probability distribution presumes) results in residual covariance matrix . In the resulted matrix, lower residual value was near zero, making the theoretical model (which was estimated based on actual covariance matrix) closer to the empirical model (which was estimated based on sample covariance matrix). In comparing the values to determine the adaptability of these two models, a standardized residual covariance matrix was calculated and the results were shown in Table 10. The standardized covariances comply with a normal distribution so when the standardized residual error is bigger than 1.96, it indicates a statistical significant difference between the implied and sample covariances . The lesser amount (< 1) of covariances such as in OilPercentage-SoilN (0.560), SoilEC-SoilP (0.057), WUE-LAI (0.068), WUE-SoilEC (0.420), SoilN-LAI (0.484) and CGR-LAI (0.248) indicates high correspondence of implied and sample covariance matrices. The residual covariances of CGR-SoilP (0.008), SoilP-LAI (0.005) were also less. The standardized direct effects (which are exactly the same as regression coefficients specified in Fig. 4) have been shown in Table 11. The standardized direct effect of LAI by 0.922 means that increasing one unit in the standard deviation of PlantArchitecture latent construct results in 0.922 increase of the LAI standard deviation. The highest amount for the PlantArchitecture construct was after LAI and WUE (0.916) was ranked to PlantH (0.811) indicating the plant’s ability for efficient leaf distribution on plant stem (also called space architecture which refers to the size, composition, and arrangement of aboveground stems, leaves, and pods, that they all function in relation to crop productivity) which in turn determines the plant capacity for synthesising assimilates through leaves photosynthesis . The values of 0.974, 0.805 for SoilEC and SoilN indicates that the application of SAP and HA was affective in sesame oil production. This collaboration and resulting 44% increase in qualitative yield by sesame seems reasonable. This fact is supported by the other results of the present study (Tables 6 and 11). The full path coefficients were obtained from the summation of the direct and indirect coefficients of every variable path. The standardized values of these coefficients help to better compare of paths (Table 11). Considering the values in the third row of Table 11 reveals direct latent constructs including SoilProperties and PlantArchitecture collaboration to QualitativeYield of sesame by 0.17% and 0.65%, respectively. The most direct effect on SoilProperties construct and PlantArchitecture construct were related to SoilEC and plantH. Considering the relations between SoilEC and nutrient availability along the physiological relations of roots and shoots , the importance of SoilEC in nutrient uptake from soil reveals more clearly. PlantH plays an important role to more effective radiation capture by leaves. On other hand, higher PlantH normally results in more efficient spatial distribution of leaves. The root mean square error of approximation (RMSEA) is one of the most important indices for evaluating the goodness of fit of a model [3, 6]. In our study, RMSEA of 0.047 indicates good competence of the measured data with the theoretical research model. The GFI (goodness of fit) criteria of the model was calculated by 0.721, the more closely to 1, the more competence the model. The current knowledge does not prepare a precise scientific tool for quantifying the effects of inputs particularly ecofriendly inputs such as HA and SAP, are being used to increase soil fertility, improve crop performance and finally food production. Therefore, these input effects were estimated indirectly through measuring dry matter yield, seed yield and leaves area. The present study demonstrated the technique by applying SEM model to aboveground and belowground relationships in an ecological sesame cropping system with emphasis on causal path in sesame oil production. The results of SEM in our study revealed four latent construct: SoilProperties, PlantPhysiology, PlantArchitecture, and QualitativeYield, confirmed cause and effect relationships between, defines their high-effective consisting variables manageable specifically and individually to triumph optimum sesame oil production and productivity based on time, cost and energy. The consisting variables of LAI, CGR, WUE, PlantH, SoilN, SoilP, and SoilEC had the most causal effect on forming sesame oil yield under field application of SAP and HA as ecofriendly inputs. On other hand, it seems that the direct HA and SAP facilities revealed increase of 65% in PlantArchitecture and 17% in SoilProperties through collaboration. PlantPhysiology had an indirect effect of 50% which was revealed through PlantArchitecture. These collaboration totally resulted in 44% increase in qualitative yield by sesame. This study can provide clues on how to improve crop production, which is one of the most challenging issues of our time. Eventually, it assists the experts to quantify the input effects such as HA and SAP effects on crop performance. The present study suggest a precise and practical tool not only to quantify inputs and management strategy effects but also helps to identify the most efficient paths which in turn prepare options to reduce production costs beside to produce healthy food and ascertain the framework of the sustainable agriculture goals. The LISREL model, methods and software have become synonymous with structural equation modeling (SEM). SEM allows researchers in the social sciences, management sciences, behavioral sciences, biological sciences, educational sciences and other fields to empirically assess their theories. These theories are usually formulated as theoretical models for measured and latent (unobservable) variables. Widely known as “Canopy Architecture” in crop ecophysiology. All authors of this research paper have directly participated in the planning, execution, or analysis of this study. All authors read and approved the final manuscript. Financial support of Deputy for Research and Technology, Ferdowsi University of Mashhad (Grant no. 40190/2016, Grant no. 37473/2015) and Center of Excellence for Special Crops (CESC) facilities for conducting this experiment is acknowledged. We thank Dr. S. Bajouri for editing corrections. Additional data may be available on request to the authors; please contact the corresponding author. We are legally responsible for information, data, used “Methods” and results. The authors confirm no conflict of interest and agree with submission of the manuscript to your journal. This research meets all the ethical guidelines, including adherence to the legal requirements of my country. The authors have not received any funding or grant. AOAC International. Official methods of analysis (OMA). In: Horwitz W, Latimer GW, editors. Association of official analytical chemists (AOAC). 20th ed. Maryland (USA). http://www.aoac.org/aoac_prod_imis/aoac/publications/official_methods_of_analysis/aoac_member/pubs/oma/aoac_official_methods_of_analysis.aspx?hkey=5142c478-ab50-4856-8939-a7a491756f48. Accessed 29 May 2012. 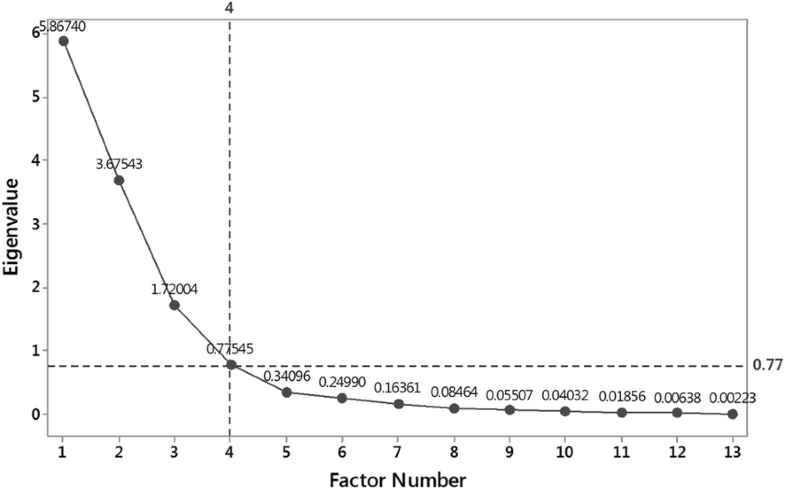 Cronbach L. Coefficient alpha and the internal structure of tests. Psychometrika. 1951;16:297–334. http://hdl.handle.net/10.1007/BF02310555. FAO. CropWat. http://www.fao.org/land-water/databases-and-software/cropwat/en/ (1998). Accessed 01 July 2017. Lamb E. Structural equation modeling in agronomy and soil science. Dept. of Plant Sciences, University of Saskatchewan. http://homepage.usask.ca/~egl388/Lamb_SEM_in_agronomy_and_soil_science.pdf (2010). Accessed 18 June 2016. Motsara MR, Roy RN. Guide to laboratory establishment for plant nutrient analysis. http://www.fao.org/3/a-i0131e.pdf (2008). Accessed 8 Aug 2017. Natesan R, Kandasamy S, Thiyageshwari S, Boopathy PM. Influence of lignite humic acid on the micronutrient availability and yield of Blackgram in an Alfisol. In: Paper presented at: VIIP 2006. Proceedings of the 18th World Congress of Soil Science; July 9–15; 2006, Philadelphia. Pennsylvania, USA. https://crops.confex.com/crops/wc2006/techprogram/P14597.HTM (2007). Accessed 9 May 2016.